Espgaluda II is a top-down shooter game. It’s a brought to us from Cave Co., LTD, and is a sequel to the arcade DLC for the Xbox 360. This app is only available for the iPhone 4, iPad, iPhone 3GS, and the 3rd gen iPod touch. This game is not compatible with iPhone3G, 1st gen or 2nd gen iPod touches (Late 2009, end 2009 8GB). If you are unsure if you can play this game, download the Lite version of Espgaluda II first. Why? Because this game costs $8.99. Please make sure you are compatible before purchasing this app. Have you ever been playing a game like 1942 or Raiden and thought to yourself “This game is too easy. I would much rather be engulfed in a hailstorm of death and mayhem.” In comes the maniac shooter games. 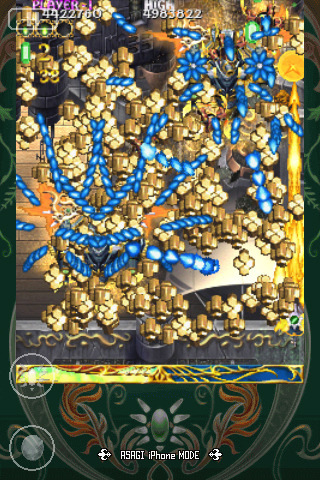 Also known as “Bullet Hell”, these games pride themselves on absolutely mindblowing projectile patterns and pixel-precise dodging. Espgaluda II is that type of game. I am not kidding when I say this is a maniac shooter. On screen, there could easily be HUNDREDS of explosions, enemy fire, your own fire, enemy units, and collectable items. All condensed into the iDevice of your choice. I am absolutely knocked senseless by the absolute careful dodging I had to do just to survive level one. You might be thinking “WHY WOULD I WANT TO PLAY THAT! ?” but hold it right there. I will state as a fact that this game is worth the cost. Espgaluda II is worth it. All enemy projectiles are on the top layer, meaning they will be seen over all other parts of the game and they are colored a purple tone compared to the gold/yellow scheme of everything else. Your character has only one part of it that can be damaged: a small plus sign in the center of your ship. Quite literally, you can nudge your ship in and out of any swarm of fire with pixel-precision and make it out without taking a single hit. Each time you kill an enemy, all of their bullets become collectibles for you that you gather to activate your special attacks. Espgaluda II then pulls you into a whole different game style with it’s version of the ‘bomb’ in most top-down shooters. When you activate the special ability “Awaken” while in the iPhone version of the gameplay, after you gather enough of the collectibles from killing your opponents, you slow down the world around you and you can touch your opponents to damage them or touch bullets to destroy them. It’s a great way to evade particularly difficult patterns or to just rack up some damage. In arcade mode, however, you’ll go into an alternate world when you touch the “Awaken” button. The bullets become red and your attack becomes an extremely powerful version of itself. The sudden red color can be difficult to see but the power boost is amazing. The game feels like a full console release. The art is absolutely beautiful. When you can see the background, it’s extremely well done with beautiful details and extremely well done coloring. Enemies are unique and very noticeable through all the gun fire, the 3 selectable characters are distinctly different in gameplay and feature really well done artistic profile images. It’s the smaller touches in the background images, levels, and frame around the screen that puts this package completely together. The music is epic and the explosions sound amazing. Japanese dialog is spoken when enemies are destroyed or bosses enter the battle. It can feel overwhelming, but that is the point of maniac shooters like these. You aren’t meant to concentrate on anything except dodging projectiles and shooting as fast as possible. Boss battles in this app are crazy and epic. The patterns these guys fire at you will drive you up a wall, but in a good way. No other game is like this one on the iPhone. I am so happy to have gotten this app as my assignment because otherwise, I might not have ever found it. Touhou fans, Perfect Cherry Blossom fans, this is your game. Portable, amazing, and absolutely beautiful, I am introducing this app to everyone I know. A well deserved 5 star epic. It is worth the price and you can even try it out for yourself for free. If you like it, support these guys by buying it. If you hate it, then you don’t waste a single dollar on the Lite version. Win-Win. 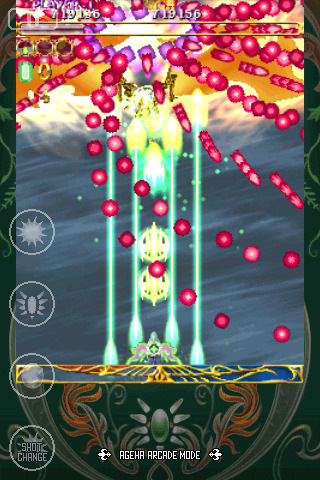 AppSafari review of Espgaluda II was written by Joseph Ho on August 24th, 2010 and categorized under App Store, Featured, Games, Scrolling Shooter. Page viewed 4798 times, 1 so far today. Need help on using these apps? Please read the Help Page.